This week, the contractors are focusing on the signal and underground utilities between 3rd Avenue to Black Bear Hole. Check back with the linked page for regularly updated schedules and anticipated work plans. You can also sign up to receive email notifications of new updates for this project. Landscaping and revegetation along the St. Vrain begins this week, as part of the St. Vrain Creek Restoration Project. Since 2013, the Town has discontinued curbside chipping. The Town invites you to drop off branches and limbs to Bohn Park on the old Vasquez softball field, adjacent to the tennis courts. Any material other than yard waste will not be accepted. 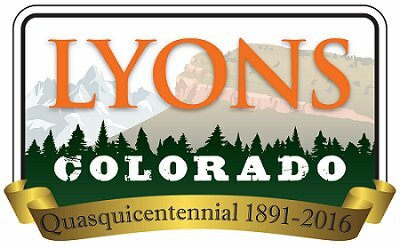 If you are unable to haul yard waste to the park, you may submit a request to the Lyons Volunteers, at lyonsvolunters.org. The Volunteers will coordinate with residents for help with pick-up. On Monday, April 4, Town Officials held a commemorative event at Town Hall. The event included live music, tours of the Lyons Depot, speeches from Mayor O’Brien and Mayor Pro Tem Sullivan, history by the Loukonen brothers and Trustee Johnson, presentations of commemorative gifts, and more. Pictures from the event can be found here. Be on the lookout for special quasquicentennial memorabilia throughout the year! The 9 Health Fair is coming to the Lyons Middle/Senior High School on Saturday, April 16, from 8:00 a.m. to 12:00 p.m. The Fair offers several free and low-cost disease & health screenings, among other services. Non-medical volunteers are needed for set-up, tear-down, registration, and more for the event. For a full list of screenings offered, what to expect, and volunteer sign-up, visit www.9healthfair.org. Additionally, the organizers of the Health Fair in Lyons are in search of a medical coordinator. This position is necessary for the event to return to Lyons after this year. Please contact Ellen Keane with interest or inquiries.